It seems like we are in a constant battle to attract and retain talent. Employees are looking for a fulfilling job with competitive pay. They want work-life balance, flexible hours, workplace wellness programs, office spaces designed to inspire collaboration and comfort – the list is never-ending. As we look to define a workplace environment that is conducive to the growing list of needs from today’s workers, what trends are most important, and how do we align with them? Our ever-changing workplace comes with an equally dynamic list of things employees crave. While a dedicated parking spot and a corner office (with a door!) were top of the list for many employees a generation ago, today’s employee needs have evolved with the reality of the modern workplace. For starters, today’s workplace is more fluid than ever. In fact, a recent study by the International Workplace Group suggests that by 2020, 50% of all workers will be remote and up to 30% of corporate real estate portfolios could be flexible workspaces by 2030. While this study, and others like it, speaks to the change in where we get work done, it doesn’t address the con­tinued need for community and how we get work done – an issue that tops many employee’s priority lists. What’s more, as desktop computers started to enter our homes and work­place in the early 1990s, demand for physical activity at work declined. In the early 1960s, about 50% of U.S. jobs required at least moder­ate intensity of physical activity, but by 2011, that dropped to less than 20%. The need for physical activity is present, and its ability to reduce stress is only one of the many reasons we need to take this trend seriously. In a recent article by Healthline, Dr. Timothy Church, Chief Medical Officer at ACAP Health Consulting, estimated that this loss of on-the-job physical activity has resulted in the average working American burning 100 to 150 fewer calories a day. This results in increased weight, especially since most Americans are not consuming any fewer calories to overcome the lack of activity. Lastly, today, more than ever, em­ployees want to feel like they have a personalized space in the office. 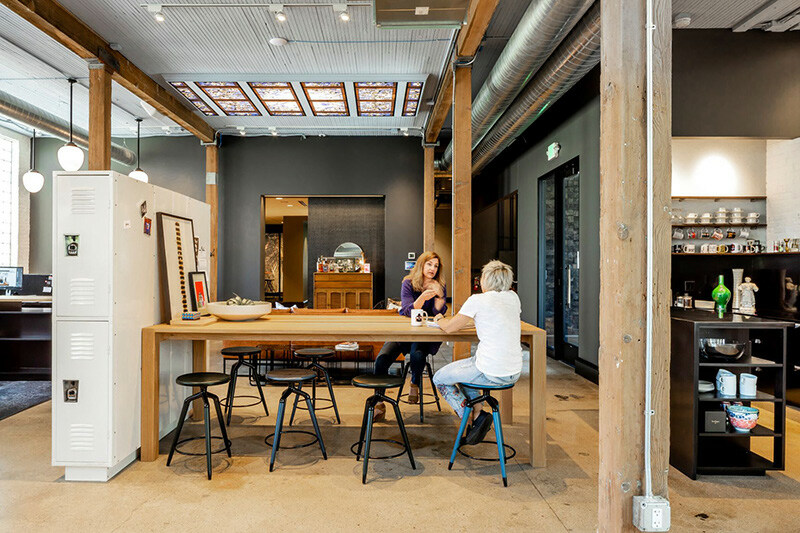 We’ve heard a lot about the resimerical trend, but beyond designing for a space that offers a home-like feeling, employees want a space that mimics their own homey feel. In fact, the same Interna­tional Workplace Group study found that 69% of millennials said they would trade in other work package benefits for a better workspace – a statistic that speaks to the desire for workspaces to be personalized and customized. As our workforce shifts to incorpo­rate new types of working arrange­ments – think remote workers, cowork­ing offices, etc. – we must begin to gauge the effect of these cultural shifts on employee satisfaction. It shouldn’t come as a surprise that remote work, just like any other shift in the work­place, comes with its fair share of pros and cons. A recent study by AND CO and Remote Year found that 30% of respondents said a lack of community challenges their remote happiness most, due to loneliness. In response to this need for com­munity and connection, companies are looking for opportunities to provide a space that empowers their remote workforce. Bridging the gap between co-located and remote work, one example of this is Sococo, a company that offers an online workplace for distributed teams. Working in Sococo provides remote workers with a sense of proximity to their team in an online space that recreates the physical workplace. Employees virtually enter the office at the start of their workday and have a full bird’s-eye view of indi­vidual offices and collaboration spaces on their Sococo Map. With full video, audio, and screen share capabilities in each room, employees can work face-to-face in any area of their Sococo office, allowing them to build human connections with their teammates and get work done effectively, just like they would in a physical office. Employees easily hold meetings, chat around the virtual water cooler, and get quick answers to questions in real-time. Working in Sococo provides the col­laboration and workflow of a physical workplace with the social awareness people crave. Likewise, companies are looking at workplace design to encourage col­laboration among employees physi­cally in the office. While some would argue that the pendulum has swung a bit too far toward the open office, we now are back into the trend of design­ing workplaces for all types of work. A well-conceived workplace features collaboration spaces, with technology such as interactive whiteboards and seating arrangements that foster a sense of community. The same space also will boast dedicated workspaces for individuals to participate in heads-down work, and won’t forget elements like privacy pods and considerations for proper acoustics. In a 2018 study, Casey Lindberg, PhD, and his colleagues took a look at the office workstation and what effect it had on physical activity and stress. The researchers collected data from 231 employees in four U.S. federal office buildings and found that people who worked in open-plan benching were 20-32% more physically active than those who worked in private of­fices and cubicles. Also, people who worked in open benching reported low­er perceived stress at work than those in cubicles. These results suggest that adopting open plan benching at work may increase physical activity and lower stress. Additionally, open-plan benching can spark more impromptu conversations and build a social connection. While data suggests this is an improvement to the traditional open-plan, be sure to include solutions for privacy when designing this open floor plan. Some of these people may be moving due to a frustration with a lack of privacy. As with most design features, open-plan benching serves its purpose when deployed in modera­tion. Mix it up with lounge spaces, huddle rooms, privacy pods, and even coffee cafes, and you’re setting up your space for movement, as well as a variety of working preferences. Beyond physical workstations, em­ployers can design a work environment that’s conducive to physical activity. Feet First is a website that offers an entire community in support of walking meetings and other forms of physical activity at work. Companies like Global­Fit offer employee wellness programs complete with financial incentives, a perk that the company claims would encourage nearly 94% of employees to invest in their health. From the way we physically design our workplace to the programs we choose to define its envi­ronment, designing space that encour­ages movement provides employees with a benefit that not only increases morale but also boosts physical health. Gaining in popularity amongst DIYers, a makerspace is a collaborative workspace designed to allow individu­als to make, learn, explore and share spaces and tools to be creative. These spaces are popping up everywhere, as people look to satisfy their desire to be creative with their innate need to cre­ate something that’s their own. They also encourage a sense of community (a tad full-circle, don’t you think?). Transitioning these principles to the theory of workplace design, employees naturally crave a sense of ownership in their space. The hackable workspace addresses so many elements of the trends we discussed, allowing employees to create a space that is conducive to their own need for community and their preferences toward mobility. Hackable workspaces feature things like height-adjustable desks, power stations that allow employees to work wherever they find space, and lighting that moves with the user. In fact, when Gensler was commissioned to design the new 600,000-square-foot corporate head­quarters for Motorola Mobility in the Mer­chandise Mart, the company employed hackable elements as a key to its suc­cess, such as micro kitchens designed based on the votes of the “neighbor­hood” - the small group of people zoned to that space, as well as moveable desks, lighting, and power sources. It’s safe to say that the days of a one-size-fits-all workplace are far gone. Today, dynamic workplaces require an equally fluid set of design principles that adhere to the goals of the com­pany and the demands of its employee base. As we look to attract and retain the best talent, we need to adhere to a new “rule book” of design principles that address the needs of today’s trends with innovative approaches that give people what they want now, and in the future.